There are certain things that just have to be around for the holidays like turkey, stuffing, candied yams—you know the drill. This Maple-Pecan Cranberry Loaf isn’t one of them. Nope. This you make purely for love, and oh, how you are going to love this! First off, this is not like some of those cakes that have the word ‘maple’ in the title but don’t deliver when it comes to taste. 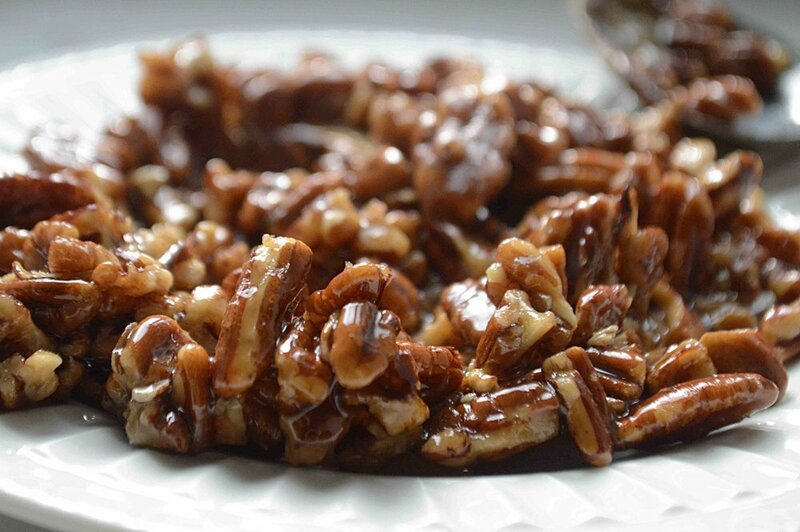 There is not only maple syrup in the glaze that you drizzle all over the top, but the actual pecans are soaked in hot maple syrup until they absorb it in all its sticky wonderfulness! Which means that you are guaranteed a true maple-y experience with every crunchy bite! 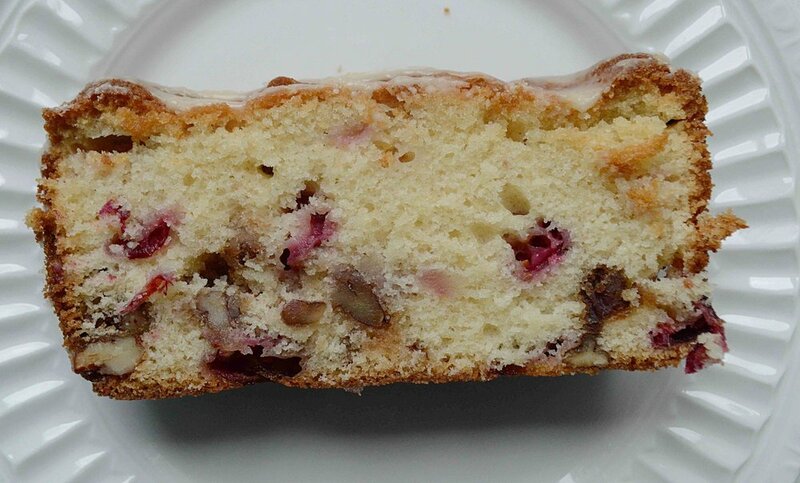 Next, the cake is just loaded with tangy cranberries and they do wonders in balancing out the sweetness of the maple syrup as well as adding a lovely splash of color! Then, there is the cake itself, which has a nice, tender, slightly buttery crumb, without being too heavy. It would be terrific to serve at a holiday breakfast/brunch or as an afternoon pick me up with a cup of tea or coffee. Definitely something to give thanks for!! Center the rack in the middle of the oven and preheat to 350º F. Butter and flour a 9x5-inch loaf pan. Set aside. To make the maple pecans: Place the maple syrup and pecans in a small saucepan over medium heat and stir for a few minutes until the syrup is entirely absorbed by the pecans. Scrape the mixture into a bowl to cool completely. If you leave in the pan, they will continue to cook. To make the loaf: Use an electric mixer with the paddle attachment or a handheld mixer to beat the flour, sugar, baking powder and soda, salt and butter together on medium speed for 3-4 minutes, until the butter is completely mixed in. It should look like coarse meal. If you are using a handheld mixer, you may need to tack on a few more minutes. Place the buttermilk, eggs, vanilla and maple syrup into a medium bowl and whisk together. Add 1/2 of the mixture to the butter/flour mixture and beat on medium-high speed for about 1 minute, or until the mixture is pale, light and fluffy. Scrape down the bottom and sides of the bowl as needed with a rubber spatula to make sure all of the ingredients are evenly incorporated. On low speed, add the remaining buttermilk mixture and beat for about 30 seconds. Scrape down the bowl again, turn the mixer to medium speed and mix for another 30 seconds. Use the spatula to fold in the cranberries and maple pecans. Scrape the batter into the prepared pan and smooth the top. Bake for 1 hour to 1 hour and 10 minutes or until the cake is golden and springs back when your press it in the middle with your finger. You can also use a cake tester and insert it into the center to see if it comes out clean. Transfer the loaf to a wire rack and let cool for at 30 minutes. Meanwhile, make the glaze: Place the confectioners’ sugar in a small bowl and whisk in 2 tablespoons of the maple syrup. Add more maple syrup until you achieve a thick but pourable glaze. 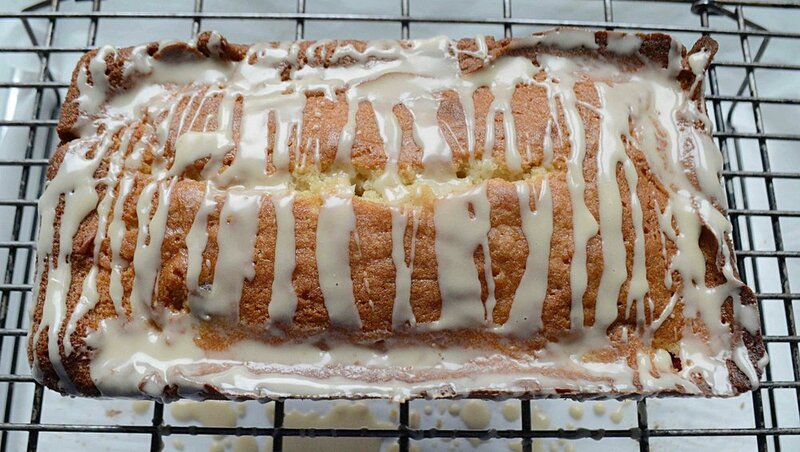 When the cake has cooled, invert it onto the rack and turn it right side up. Place a tray underneath it or a piece of parchment paper to catch the drips. Spoon the glaze over the still-warm cake, letting it run down the sides. Let cool completely. To serve, cut thin slices. Store cake, well-wrapped in plastic wrap at room temperature for a few days.